Our missional community was asked this past week by Brandon who leads our discussions, “what scripture brings you comfort?” For me, I’d say Isaiah 41:8-20 is one of many that brings me comfort because it demonstrates how powerful and mighty our God is. 8 “But as for you, Israel my servant, Jacob my chosen one, descended from Abraham my friend, 9 I have called you back from the ends of the earth, saying, ‘You are my servant.’ For I have chosen you and will not throw you away. 10 Don’t be afraid, for I am with you. Don’t be discouraged, for I am your God. I will strengthen you and help you. I will hold you up with my victorious right hand. 11 “See, all your angry enemies lie there, confused and humiliated. Anyone who opposes you will die and come to nothing. 12 You will look in vain for those who tried to conquer you. Those who attack you will come to nothing. 13 For I hold you by your right hand— I, the Lord your God. And I say to you, ‘Don’t be afraid. I am here to help you. 14 Though you are a lowly worm, O Jacob, don’t be afraid, people of Israel, for I will help you. I am the Lord, your Redeemer. I am the Holy One of Israel.’ 15 You will be a new threshing instrument with many sharp teeth. You will tear your enemies apart,making chaff of mountains. 16 You will toss them into the air, and the wind will blow them all away; a whirlwind will scatter them. Then you will rejoice in the Lord. You will glory in the Holy One of Israel. 17 “When the poor and needy search for water and there is none, and their tongues are parched from thirst, then I, the Lord, will answer them. I, the God of Israel, will never abandon them. 18 I will open up rivers for them on the high plateaus. I will give them fountains of water in the valleys. I will fill the desert with pools of water. Rivers fed by springs will flow across the parched ground. 19 I will plant trees in the barren desert— cedar, acacia, myrtle, olive, cypress, fir, and pine. 20 I am doing this so all who see this miracle will understand what it means— that it is the Lord who has done this, the Holy One of Israel who created it. photographer Natalie Norton explores 6 ways you can hand hold lenses at low apertures and low shutter speeds and still avoid blurry images caused by camera shake. I’m a mover and a shaker in general, and this is particularly true when I’m on a shoot. I’m twistin’ and turnin’, climbin’ and jumpin’ and to top it all off, I DO NOT have a steady hand, plain.and.simple. Once a week, Corbin and I like to visit my mom. On this particular day we decided to order a sub sandwich from Lenardo Pizzeria and have a little picnic at Nancy Jane Park near her home. It was a gorgeous day and perfect for a picnic. After we picked up our food, we headed over to the park. We found a nice shaded parking spot, parked, and went on a search for the perfect picnic location. Under a huge pine tree is where we found our resting place. 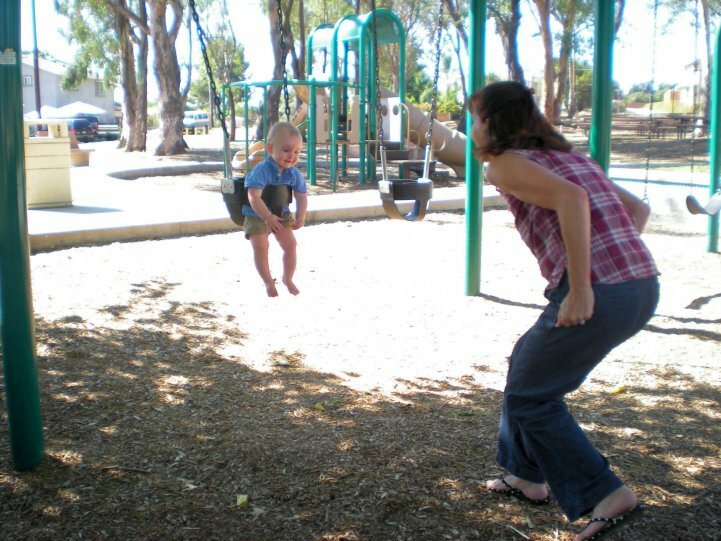 With our tummies full and rested awhile, we decided to pack things up and head over to the swings. Corbin had loved the swings at other parks we’ve been to, so I thought my mom would enjoy seeing Corbin laugh and squeal with delight as he swung back and forth on the swings. She did. We enjoyed finding ways to make him laugh. We’d chase him and we’d count to 3 while getting closer and showing him our tickle fingers…it was fun. Thanks mom for a fun day. Today we had the Oma Pumpkin Patch experience. About 10 friends and their kids met us at the Van Ommering Dairy Farm in Lakeside. It was a little hectic throughout our stay, but we ended up having fun in the process. They have a ton of activities to keep kids occupied for hours…especially kids ages 3-10. We went on a hay ride and saw lots of cows, ate lunch and played the afternoon away. I heard Corbin wake and after waiting a few moments, I went in to get him. 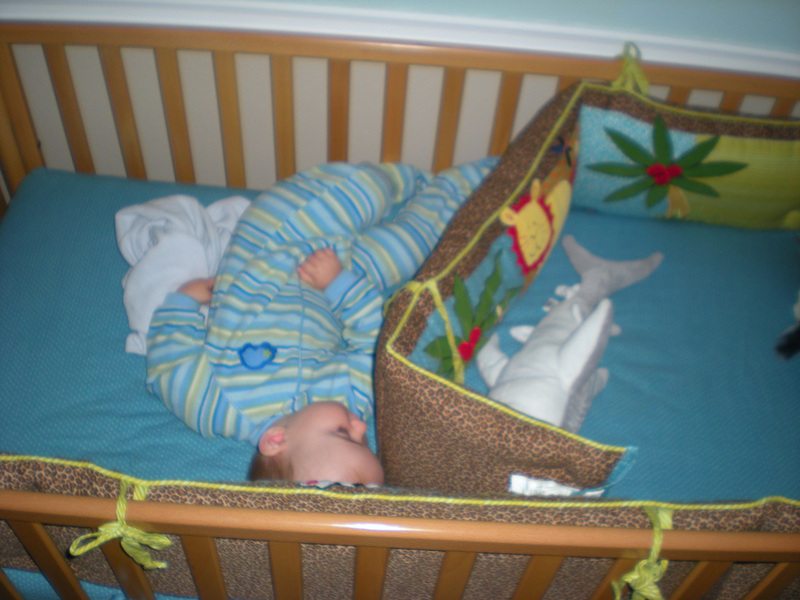 When I opened the door and peeked over the crib railing this is how I found him (see photo). He had turned himself sideways, pulled his socks off, pulled part of the bumper down and was talking to himself. What a funny boy. This past weekend we were able to get out of town and visit Luke’s family up in Hesperia. While we were there I was able to wear a turtleneck and sweater which made me extremely happy. We also made Luke’s moms famous chocolate chips cookies (more like scones with all the flour she adds…hehe), visited a pumpkin patch and walked thru a corn maze, hung out with the Shiras and Divine family, ate lots of food and relaxed. It was good to get away. I am feeling a bit blah today. I can’t exactly pin point why because I think it’s an accumulation of little and big things. In a few months I will be turning 30, my baby will be turning 1, the finances are getting tighter and are praying and seeking Gods provision, my spiritual walk is shaky right now…maybe it’s hormones. Ha-ha, what a copout. I especially cannot stand the weather right now. It’s October and it was 96 degrees at my house yesterday. I have a feeling we won’t see much of fall this year and we’ll jump right into winter. Sucky! Oh, I want to cry. I know all these things are totally circumstantial and I need to let it all go. Only Christ can fully sustain me…just shows my disbelief I suppose and especially my need for Christ. I just want to yell sometimes “Why God! Why do we have to go through these trials? Why do you have to strip us of everything?” of course I know why…because Jesus needs to be our all and material objects will not suffice…because trials help us to grow in our faith and give us perseverance. Lord, help that to be real in my heart and not just words. I confess, my BIG idol is comfort. When I feel comfortable, I feel loved and taken care of. My struggle is feeling content in all circumstances. When we have “0” in the bank or when we have plenty. I also struggle because I lack joy in all circumstances. I tend to be an optimistic person , but when my world is shaken, I find that I quickly get depressed. Not like I need medication depressed, just overwhelmed with my feelings. During these small relapses, I still preach the gospel to myself and remind myself of Christ’s everlasting love for me, but a piece is still missing because I am lacking the joy that those people get when they lose everything and they still have this glow about them, true joy and peace. I’m a work in progress…that’s what I like to say. Slowly I believe these issues will be worked out…it may take longer than I’d like, but it’s still progress. On Saturday, we decided to go to Mt. Helix to see the cross. I was looking forward to sharing this experience with my men since they have never been. It really is a beautiful place. You have a 360 degree view of San Diego and it’s breathtaking. Some people go regularly and hang out and talk, read, relax and take pictures. I personally love it there and think it’s one of San Diego’s most unique and over looked spots. The funny part of our trip was when we started walking to our car to leave. It ends up that there was some kind of Vespa gathering on the same day. If you’ve ever been to Mt. Helix you know there is only a small parking lot at the top, so we were blocked in. Yes, there were that many Vespa’s. Plus, a car decided to park behind us making it impossible to leave. We got a good laugh out of it and took some pictures (of course).